A quick and easy jell-o salad that can be made with your favorite flavor of jell-o. Bananas and whipped topping are all it takes to give this jell-o salad a special taste. In a serving bowl, prepare the jell-o according to the package directions. Add sliced bananas so that they are spread out evenly on the top. Put the bowl of jell-o and bananas in the refrigerator until the jell-o is firmly set. 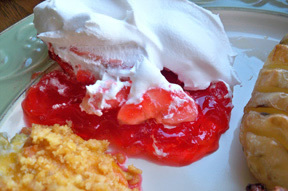 When firm, remove from the refrigerator and spread the whipping topping over the top. Spread an even layer on the jell-o about three quarters of an inch thick, or desired thickness. Serve immediately or store in the refrigerator until you are ready to serve it.